I have a Indian Star Tortoise. Its near about 10 inches in length. From past 2 days there seems to be some problem in his right leg. It cant bear its weight so its dragging its right leg. Can anyone please tell me what should i do for this. Thank You. @amir siddique, very sorry for replying late as i read ur comments rite nw.... There is Doctor called as Hukkeri in Dombilvi East Near Garda Circle... If u have any problems then get in touch with him!!! 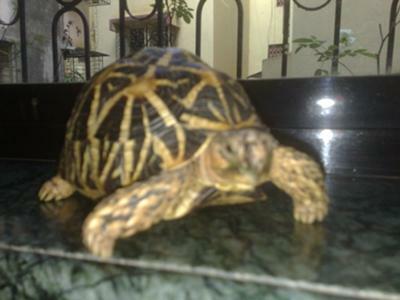 bro my star tortoise also has same problem from 3 to 4 days if u find sm vet plzzzz tell me?? ?but mine has problem in its back right leg??thnx? I suggest you take your pet to the vet. It has a problem and needs help.